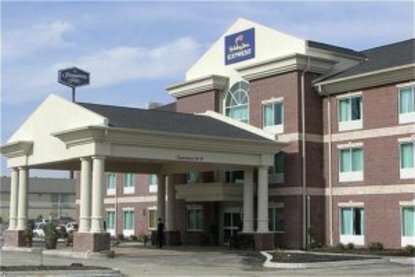 The Holiday Inn Express Carrollton is conveniently located off of I-71 and near Kentucky Speedway & Belterra Casino.We are suited for your business or leisure travel needs. Come and visit historical Carrollton, KY and step back in time at General Butler State Resort Park.Our professional & friendly hotel staff looks forward to the opportunity to make your stay satisfying & enjoyable. We will go out of our way to exceed each of your expectations in product offerings & service. After just one visit, you will leave with an &regat home&reg feelingEarn extra Priority Club Rewards by booking the Priority Club Rewards 1000 Points Bonus Package. Our hotel offers our famous Express Start Continental Breakfast featuring the best tasting cinnamon rolls. Stay Smart at the Holiday Inn Express Carrollton & enjoy our other offerings such as Simply Smart Bath & Bedding Programs, free high-speed Internet access, business center, a refreshing indoor pool & a fitness center to stay in shape while on the road. Come and visit with your Holiday Inn Express Carrollton family This hotel is committed to providing accessible facilities under the American Disabilities Act. If your accessibility needs are not met, please contact the Hotel Manager on Duty. Should you require additional information regarding accessible facilities for guests with disabilities, please call 1-800-Holiday (U.S. and Canada) or contact the hotel directly. For the hearing impaired, TDD service is available at 1-800-238-5544 within the U.S. and Canada.